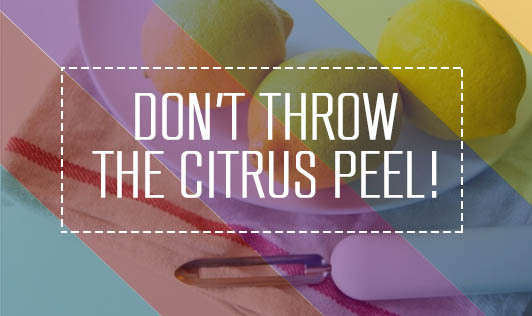 Don't throw the citrus peel! Citrus peels like lemon, lime and orange peels often go in the garbage as waste. However, they have many uses in food and cleaning. Find out the different ways you can use the so called waste to make it fruitful. • Make zest - use the small side of the grater and grate just the peel (leave the white part behind) and freeze it till the time of use. You can even dry and powder it and mix it with salt/sugar or pepper to make flavoured citrus peel. • Citrus olive oil - Pound zest and soak it in olive oil for 6-7 hours and remove the peel. • Infusions - soak the peel in sugar syrup, honey or vinegar to make infusions. Remove the peel and store the liquids in a clean jar. • Clean your microwave - place lemon rind in a bowl with water. Heat for 5 minutes, remove the bowl and wipe the microwave with a clean cloth. • Coffee and teapot cleaner - Boil lemon/orange peel in the teapot or coffee pot for 5-6 minutes and wipe clean. • Whiten your nails - rubbing lemon rind on your nails will give you whiter nails. • Skin brightener - use orange/lemon peels to rub on the face and get brighter skin. So, don't throw away citrus peels without making full use of it!